Greek wedding invitations olive pattern, square, classic in style coming with white, pearlised envelopes printed on an white board and your bespoke invitation on an white card with an olive-branches pattern. The postcard is printed in plain olive foil and the design of the envelope is finished with an white, satin ribbon, the guest’s name tag elegantly attached to it. Size: 20 x 20 cm. 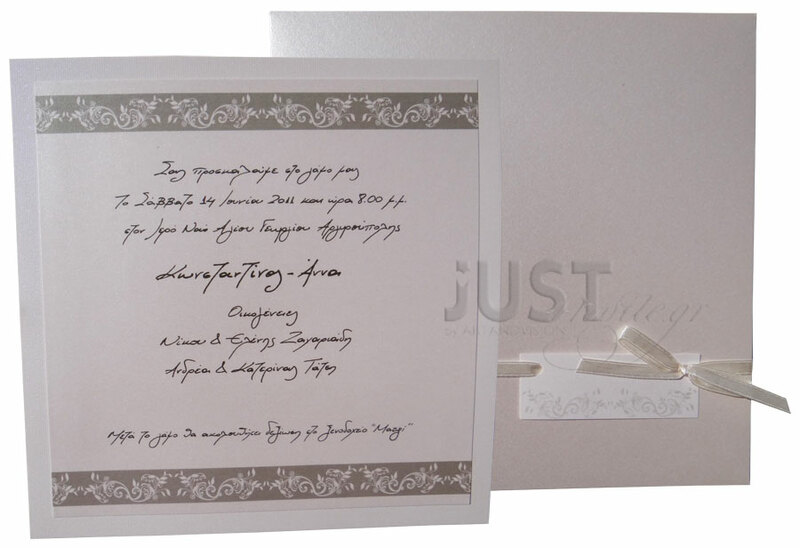 https://www.preciousandpretty.com/2017/10/elegant-invitations-for-greek-wedding-A1105.html Greek Wedding Favors|Orthodox Crowns|Stefana|Baptism Invitations Elegant invitations for greek wedding A1105 Wedding invitations, in elegant classic style with olive-branches pattern and satin ribbon. Product #: Greek Wedding Favors|Orthodox Crowns|Stefana|Baptism Invitations_5342265812011976148 5 stars out of 5 reviews.